The multi-award-winning SmartPass study guide with and without commentary options enables the student to choose pure Shakespeare or the fully explained SmartPass & Shakespeare. Full-cast, unabridged performance with comprehensive commentary and analysis for any student to fully understand and appreciate the play. "And nothing is, but what is not." Macbeth may be mystified by the Weird Sisters' words but this intense performance with incisive commentary cuts to the heart of Shakespeare's complex psychological tragedy. Please Note: This audio references accompanying material that is not included with the purchase of the audiobook. ©2006 SmartPass Ltd. (P)2006 SmartPass Ltd. I thoroughly enjoyed the "SmartPass Plus Audio Education Study Guide to Macbeth". As a non-native speaker of English, Shakespeare has always been an intimidating author for me. I have gone through Macbeth in several forms (book, as well as "rock opera" by US band Jag Panzer and German band Rebellion), and had the impression that I understood most of it. This Smart Pass version shattered that belief... there is so much more to learn about Macbeth!!!! Smart Pass feeds the play to you "step by step", so you understand context and references, and clearly points out major themes. Once you have been through the "step by step" version, Smart Pass gives you the entire uninterrupted play to enjoy. I would recommend Smart Pass to anyone studying, or interested in, Shakespeare. I am definitely going to download more Shakespeare plays by Smart Pass! The play is interpreted by an excellent cast. It can be listened to for its own sake. But half the recording consists of the same interpretation but interspersed with interesting and intelligent commentaries. Even when one knows the play well, there is much to be learned. This is absolutely the best way to read/listen to Macbeth. The actors are fantastic, and the commentary from the narrator is just right to explain what is happening and what the characters are saying (for those of us who have trouble understanding Shakespeare speak), without too many interruptions. There are great sound effects and the narrator is easy to understand and has interesting opinions. Highly recommend this book. By the way it is the perfect length. the actors are great and the commentary explaining the important lines is very helpful. I do wish the chapters were broken up clearer: something like 1 act per chapter would be much easier to start with. I wind up making my own bookmarks to make up for this. These SmartPass dramatizations with a teaching commentator are excellent. There are several others and they are just as good. What made the experience of listening to SmartPass Plus Audio Education Study Guide to Macbeth (Unabridged, Dramatised, Commentary Options) the most enjoyable? The "teacher" interrupted at the right time, with small historical snippets to help understand the setting. The witches were well portrayed, with scary voices that lived up to Shakespeare's verse. All characters performed well and could be visually seen with their voices. The commentator was someone who I wish I would have had as an English teacher in high school! Or college even! She emitted enthusiasm that made me want to listen to the entire unabridged play with more meaning. Held my attention from beginning to end. 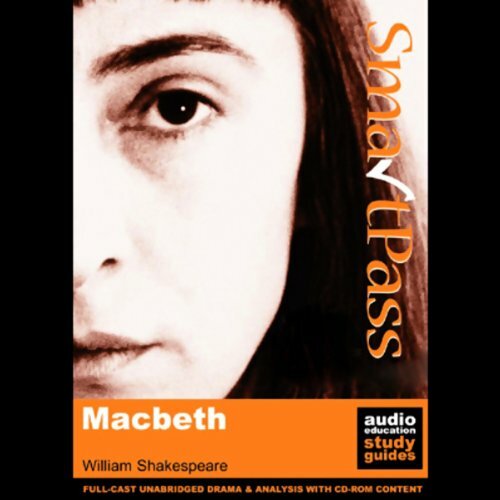 Would you listen to SmartPass Plus Audio Education Study Guide to Macbeth (Unabridged, Dramatised, Commentary Options) again? Why? This was my first experience with SmartPass and it was very impressive. I'd attempted Shakespeare in the past (I'm long past college...) but the language barrier turned me off. The narration and explanations allowed me to easily follow the story and characters. I would definitely listen to other SmartPass offerings (I already purchased Hamlet) and would highly recommend Macbeth. Interpretation of 17th century English! I was shocked at the brutality. Yes, because it helped me to easily understand Macbeth as it was meant to be comprehended. I needed to know this piece of literature for my Comp 2 class, this audio book helped immensely! I liked Macbeth's descent into insanity after the initial killing of King Duncan. Macbeth was my favorite character. He was very well rounded. Did SmartPass Plus Audio Education Study Guide to Macbeth (Unabridged, Dramatised, Commentary Options) inspire you to do anything? It inspired me to download more audio books, because it was the first one I've ever downloaded.